Before the opening of the St. Petersburg International Economic Forum, Ben Aris, editor-in-chief of Business New Europe and contributor to RBTH, sat down with Kirill Dmitriev, the CEO of the Russian Direct Investment Fund, to discuss how Russia can improve its image as an investment destination. President Dmitry Medvedev has launched a drive to improve Russia’s investment climate and is putting $10 billion of the state’s money where his mouth is: the Russian Direct Investment Fund. The new sovereign wealth vehicle aims to attract the world's leading funds to co-invest in major projects. The hope is that it will dramatically increase private equity investment by reducing the perceived risk of doing business in Russia. 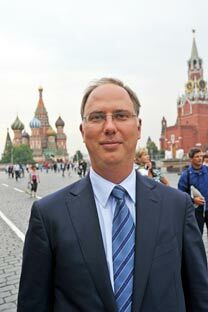 The appointment of Kirill Dmitriev to run the fund is a testament to the commercial nature of the project. One of Russia’s new generation of rising business leaders, Dmitriev cut his teeth working as a manager at Delta Private Equity Partners, a US-government backed investment fund designed to promote capitalism by financing the growth of independent business in Russia. He then set up the highly successful Icon Private Equity – a $1 billion fund that invested in projects across the CIS. At the same time, he founded the Russian Association for Venture Capitalists and advised the government on the creation of the Russian Venture Company, a state backed fund promoted by Prime Minister Vladimir Putin to kick start the country's venture capital sector. Dmitriev is currently hiring staff, mostly Russian professionals, and the first $2 billion will be released by the state in September. The first investment is anticipated by the end of the year, said Dmitriev. After that the state-owned debt agency and de facto development bank Vnesheconombank (VEB) will release another $2 billion each year over the next four years. The Kremlin hopes that the fund will also attract $90 billion from private co-investors. The structure of the RDIF fund is designed to allay the fears foreign investors have about investing into Russia. Such worries are illustrated by the Russian stock market, which has been the best performing significant market in the world over the last decade, but is still stuck with an average price-to-earnings ratio below 7 – a stark contrast to the early teens enjoyed by other major emerging markets. Russia also performs way below emerging market peers in terms of both incoming portfolio and direct investment volumes. A major focus for the fund, then, is to offer major investment firms some reassurance. With the state limited to a minority stake, investors will not only have the security of a controlling stake, but more importantly, the state will share the risks and be subject to the same rule of law and corporate governance practices as its co-investors. The structure of the fund is also designed to allow it to tap into the expertise of what are planned to be the best investors in the world. An investment committee, which will meet whenever needed, can approve deals up to $250 million and will feature professional investors from both Russia and around the world. The supervisory board, which will meet four times a year, will determine the strategy and also approves deals between up to the $500 million maximum. Government officials will join that board, but international institutional investors and professionals will make up the majority. The final level of supervision will be an international advisory committee composed of representatives from the leading global funds and getting together once a year. Among the international investors that have already expressed an interest - and will probably end up on the international advisory board - are Goldman Sachs, Blackstone, the Abu Dhabi Investment Authority, Kuwait Investment Authority, China Investment Authority, Permira and Caisses des Depots. The point of roping in all these big names is to create the same sort of creative discussion found at events like the annual Davos convention, with the difference that the funds can actually act on their insights. At the last Davos meeting, Dmitriev noted, the main global themes were the rise the middle class, the rise in commodities and energy, and the importance of infrastructure – all of which are key Russian stories and represented in the fund’s target sectors. The CEO says he is looking for investors willing to make a long-term commitment with an investment horizon of five to seven years, and where the RDIF would not own controlling stakes in businesses, but could do so alongside investment partners.